With the introduction of precision medicine comes a fundamentally new way of treating patients. It introduces a new paradigm for disease classification, diagnosis, and treatment. The growth of precision medicine introduces a shift away from treating the population as a whole, to treating each patient as an individual. 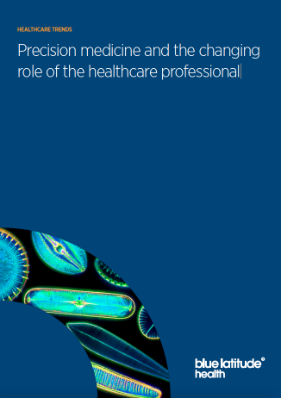 How does this change the role of the healthcare professional (HCP) in the patient journey? Associate Consultant Ditte Funding discusses the challenges and opportunities facing HCPs as this new approach continues to take shape. Historically, healthcare professionals have taken a broad approach to treating the patient population, and most medicines are currently prescribed empirically. In some cases, such as with anti-inflammatory drugs for pain relief, most patients respond positively to these treatments. For other therapeutic classes, such as antidepressants, responses are variable and each patient will respond differently. At present, the treatment approach is to try a number of agents until a satisfactory response is achieved. Precision medicine is an individualised approach to healthcare that tailors the treatment of each patient through appreciating variability in the genes, environment, and lifestyle of each person. It involves identifying patients who are likely to respond well to a particular agent, both in terms of efficacy and safety. With precision medicine, the HCP’s role and influence in the patient journey will change. The HCP will be exposed to a much more complex approach to treating patients, greater patient empowerment, and the need to adapt to many new technologies and players entering the medical space. Patients will be stratified based on their differences, and HCPs will be able to predict much more clearly which patients will respond well to which medicines. However, its success is entirely dependent on HCPs adapting to this influx of change and complexity, and other stakeholders working collaboratively with them in order to enable and prepare them for this new treatment environment. A key component of precision medicine is data, and, in some ways, data can be considered the new currency in healthcare. Big data is what enables this personalised approach to healthcare. It’s through collecting large volumes of data that the potential impact of gene variability, environment, and lifestyle have on the success of a certain treatment can be tracked. However, in order for it to be useful, HCPs will be required to handle multi-parametric data and possess some ability to decipher “-omics” data. Precision medicine’s success is dependent on healthcare professionals adapting to an influx of change, and other stakeholders collaborating with them to enable them for this new treatment environmentIn the past, medical degrees have not included genetics and deciphering “-omics” data as core modules in the curriculum. This means that HCPs may not be able to correctly read this kind of data and use it to drive positive patient outcomes. We are able to sequence a patient’s genome for less than $1000, and the crucial problem is no longer being able to gather this kind of genetic and “-omics” data, the problem is now that HCPs need to be able to analyse it and action it when presented with it. Not only will HCPs be required to understand data to identify different patient sub-types, they will also need to adapt to new disease taxonomy. There are constantly new sub-classes of diseases being identified, for example in breast cancer, and how each disease is classified is frequently evolving. In the space of precision medicine, the HCP needs to stay up-to-date with substantially more data, and they may be ill-equipped to deal with the anticipated complexity and volume of new information.